My love for this city is legendary, I love it even more than my Playstation, which is a deep and serious love indeed. I’ve happily laid back and thought of London while various friendly antelope have abused my body like a mat in a fitness studio. My years in Amsterdam have been wonderful, however a change has come upon this city that needs to be addressed. Which brings me to the subject of today’s post. Amsterdam tourism. I’m not sure if that’s true. Here are some solutions to common problems in Amsterdam. I could go on. So as you see I can offer solutions. Waffles and Ice Cream stores go together like black schools in racially mixed neighborhoods in the Netherlands and weak excuses to justify their existence. It used to be that if you wanted to avoid tourists in Amsterdam, you’d simply stay well clear of the area between Museumplein and Central Station. Avoiding tourists was as easy as a one night stand after getting a match on Tinder on a Friday night around one am. Now, thanks to Airbnb, tourists are everywhere. It’s such a pleasant sight to have the smell of freshly smoked weed wafting in from the garden next door, where the owner has let out the apartment to tourists. It’s a joy to be woken up at 3am by the drunken shouts of tourists coming home from a night out in the early hours of Monday morning. The solution is simple. 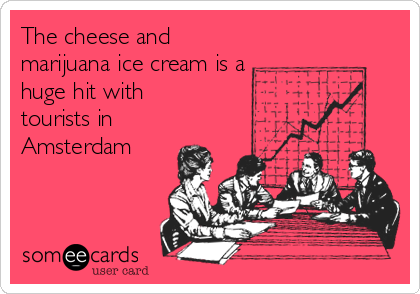 Amsterdam city council should simply get a consortium comprised of ice cream store owners, cheese shop merchants, Airbnb, Starbucks and Disney to buy the city outright. It’s happening by stealth anyway, so they should just make it official. Explore the curious and wondrous world of Ecaterina, a Romanian expat who like the rest of the population of her country has left Romania and is now living in the Netherlands. Follow her adventures as she’s patronized and spoken down to by the locals, even though she has a masters degree in business and is very successful. Watch as Dutch men send her angry messages on Tinder when she refuses to agree to have the first date in their bedrooms. Cringe as locals tell terrible jokes about hanging on to their handbags, and checking to see if their bikes are still where they left them. It’s a heartwarming story of Dutch tolerance and Romanian resilience. A must see. What do you mean, I can pay for dinner with the copy of your pincard that I cloned earlier? Tourists will be stunned and amazed at how two people who appear to be unemployed, live the magical life of a king and queen. Leuk! Anouk is normally such a good girl. When horrible boys try and talk to her in bars, she shouts and shouts and shouts at them till they run away crying with bleeding ears. Some say she’s cold and frozen. One day she discovers a magical smartphone app. With a single swipe and a wish, her prince charming appears and stays with her forever! Well for one night actually but the following weekend she does it all over again. One day her prince will come and then quickly disappear, like a rental makelaar/agent after a tenancy agreement has been signed. What a brave and fearless mouse he is. Amsterdam is already on its way to becoming a playground for tourists. It’s about time the city council go the whole hog and sell it to Disney, Starbucks and other interested parties.